Mon - Sun 11:00 a.m. - 9:00 p.m. I typically avoid any restaurant that has pictures of the food on the wall and on menus but decided to give this one a try when I was in San Francisco in the Chinatown district. Pleasantly, this was not an "American" style Chinese restaurant and I was in for a great culinary experience! The restaurant is small but the service is amazingly quick. Not only is the service good but the noodle bowl I had and potstickers were amazing with great depths of flavor and a freshness you rarely experience, anywhere. The potstickers are served with black vinegar, a great dipping sauce on its own, but the most surprising part was how flavorful the dumplings were! I'm used to bland ones you get at 99% of the "Chinese" restaurants in America and was very pleasantly surprised. I could eat a couple of orders of them alone! I also ordered the hot and spicy pork noodles and all I can say is WOW! The broth has a very strong pork flavor and you can tell it has been cooking for a long time to contain all of the notes of pork and spices. After a very disappointing day I got take out from here and it was good enough to make me feel (at least a little) better. I got the Wuhan hot dry noodles, spicy pork belly (both AMAZING) and the Dan Dan noodles (I thought it was meh). They were very busy so I was glad I had called in with my order. But pluses in support of dining in: The dine in portions were HUGE and they charge 30 cents per takeout container which doesn't exactly make sense since I'm pretty sure they won't be happy if I take my own container so it's not like that's encouraging people to be greener. But that's not really a deterrent. I'm glad to have found this place. Will be coming back and ordering the exact same things (except the Dan Dan noodles) in the near future. 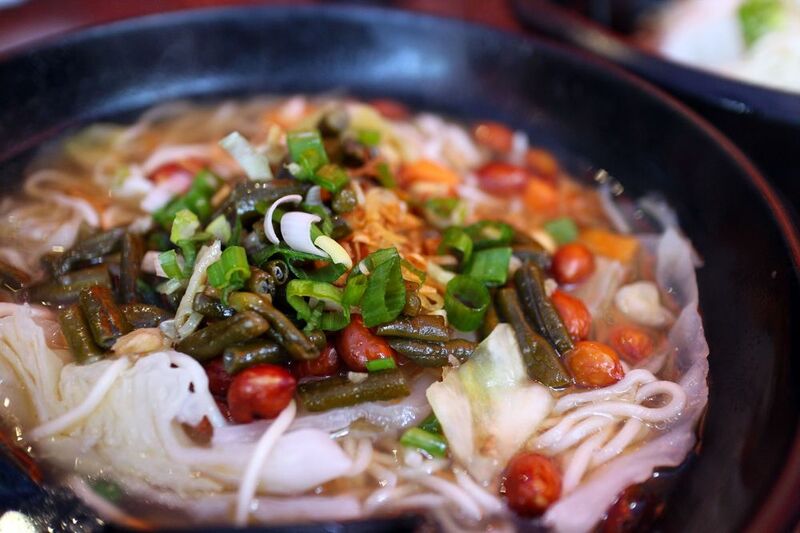 Numbing Noodle Soup: Really spicy and really flavorful! The noodle soup was packed with peppers; they are soaked in the broth and intertwined in the noodles. Although it is decently spicy, its not unbearable and can be tolerated by any spicy level. Of course, there is a lot of spice at the table so you can add as much heat as you like! Along with the spice, there is a lot of savoriness that is absorbed by the noodles. Keep in mind, all the broths are quite oily. Wu Han noodles: these are my favorite dry-style noodles on the menu! They have a strong peanut butter flavor and are infused with peanuts, green beans, and a few red chili peppers. This is not a spicy dish though, you can barely taste the spiciness compared to other dishes on the menu so its a safe bet for those who want a neutral, nutty dish. Tan Tan noodles: this has a hint of spice but not nearly as chili pepper flavored a the numbing noodle soup. There are a lot of shallots and this soup has a really strong green onion flavor, it gives the dish such a savory component! This is definitely my favorite soup on the menu. I like it because its really savory, and you can add as much spiciness as you want so you get the best of both worlds! I feel like the numbing soup is mainly focused on the spice so its nice that this broth gives you both components. Note We make traditional Chinese food and this is chain store No.6. Our Szechuan spicy might be spicier than normal spicy. Please inform server you want no spicy or less spicy. Some of the dishes might contain peanut, some noodle dish have more paste than other. Please inform server before order.